One of the things that I enjoy the most about my efforts to watch more LGBT movies is how I never really know what I'm going to get into. As much as I scour various lists of top LGBT movies to watch and things of that nature, I don't really remember why these movies were cited by the time I get around to watching them. And I guess that helps me avoid any preconceptions when it comes to these movies. So if I like them, I honestly like them. If the whole thing just feels like a big mess, then I can't really fault that impression. Case in point, I totally glossed over the fact that Breakfast on Pluto features Cillian Murphy in the lead role. But I suppose it makes sense - the man has had quite the diverse acting career thus far. Plus he has such delicate features - so it also works from a visual perspective as well. I had some difficulty in trying to understand a fair amount of the highly-accented, softly spoken dialog, I have to admit. But the movie is still pretty brilliant and it's worth the investment of time and effort (at least the effort applied to my case). 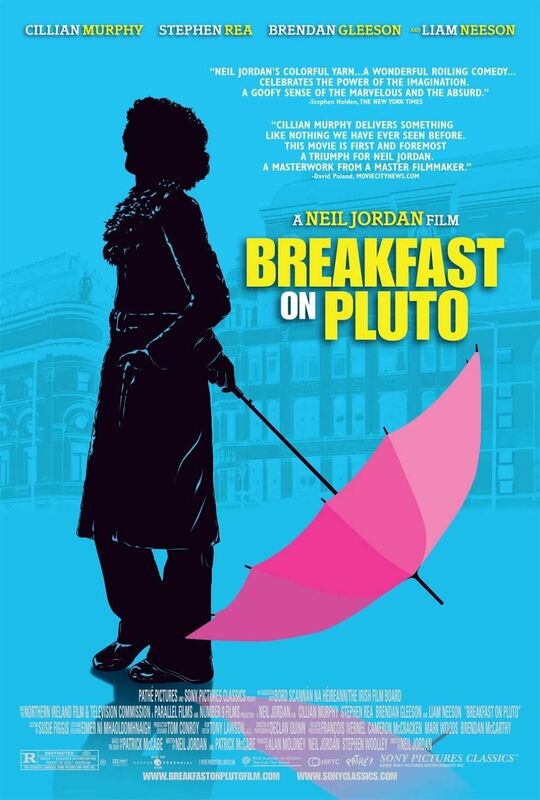 Synopsis: Breakfast on Pluto is a 2005 comedy drama movie written and directed by Neil Jordan. It was based on the novel by the same name by Patrick McCabe and it has won a number of awards, many of them centered around the performance by Cillian Murphy. The movie begins at the end, more or less, with a beautifully made-up Patrick "Kitten" Braden (Cillian Murphy) pushing a baby tram around. After a little flirtation with some laborers, she begins to introduce her life story to us. The entire trip through her life is divided into quite a number of chapters, each one really just consisting of a scene or two. And given her transgender nature, from the very beginning the movie stresses this such as describing how she was found abandoned on the doorstep of a parochial house where she is arbitrarily treated as male based on her genetalia. She grows up in the fictional Irish town of Tyrellin in Norther Ireland. She initially makes friends with Charlie (Ruth Negga) along with a few others who generally accept her gender identity. She also refers to herself as Kitten or as Patricia at times, further reinforcing her concept of self. We follow her adventures in life and love but on the whole her greater focus is to find out who her mother is. And this aspiration defines her life in many ways and her future direction. The movie tackles two somewhat complex concepts with a comedic framework - transgenderism and of course the whole situation in Northern Island. It manages to do so in a manner that is not overly oppressive or "heavy" and yet it also doesn't fall into the alternate extreme of belittling such things. And I've seen quite a number that tackles the IRA and this was one that I rather appreciated, although I'll concede it's not like this side to things dominated the story in any way. Cillian Murphy was indeed quite brilliant in this movie and his acting is really what elevates this into art. Yes, there's not getting away from the fact that this is a movie focused on a man who spends most of it in a dress. But as you get involved with the movie, you just get carried away with her story and thus the continued magic of films like this. Not many LGBT movies have tackled transgenderism quite as well as here. It's too easy to fall into the trap of tropes and stereotypes or exaggerated caricatures of such individuals. But here we have a fully realized character with concrete goals and aspirations and a rather complicated life given the lack of true understanding of her gender. I'll concede the movie isn't for everyone and the accents don't make it any easier to appreciate right off the bat. The pacing is rather measured almost the point of seeming slow to others, but it's still worth the viewing, I assure you. It's a smarter film and one that requires a bit more brain power, something I find to turn off a lot of folks when it comes to movies. And that's a darned shame given the quality of what had been put together here. Breakfast on Pluto is a simple tale told by a complex character in a rather dynamic historical period and setting. It's not the sort of comedy that will make you laugh out loud, but it will make you smirk and think about how ironic this or that was. Thus the movie gets a respectable 3.5 rather stunning looks for Kitten out of a possible 5.